This is the tenth post in a series that will eventually comprise an activity-based, unit pioneering program curriculum. X. This lashing is useful when building any kind of raised surface for a: platform, deck, raft, table, bench, chair, or Chippewa kitchen. 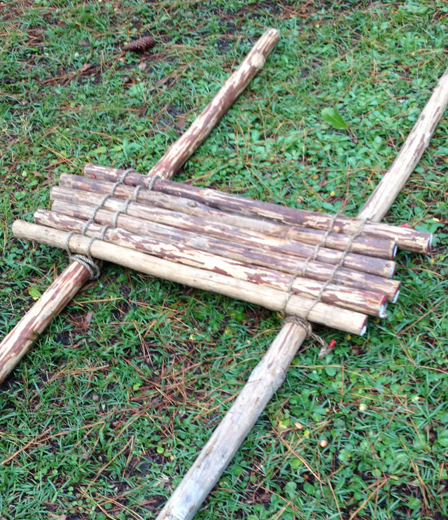 Each Scout will tie a complete floor lashing, attaching floor spars to a platform support. Lay out the two support spars parallel to one another so they are about 30 inches apart. Place the floor spars over the support spars, in the middle and against one another, making sure the ends extend out from the support spars 2 to 3 inches on either side. Up against the first floor spar, tie one end of the lashing rope to the platform support with a cove hitch, leaving enough “tail” at the end to twist around the long end of the rope before continuing. Grab this bight and pass it underneath the platform support. Loop the bight over the first floor spar on the outside of the platform support. Tighten both loops around the first floor spar by pulling the running end (extending between the first and second floor spars on top of the platform floor). Repeat this process for each floor spar until you reach the other end. Secure the running end of the rope to the other end of the platform support, with tight half hitches. B. The above procedure can be implemented by two Scouts simultaneously lashing both ends of the floor spars to their respective platform supports. When a platform is completed in a manner where the floor spars are snug, one Scout can sit on the floor spars and four Scouts can carefully lift him up.